Now that Tangled Yoke is out of the way, it’s time to audition new projects. I’ve actually started Tilted Duster from the same issue of Interweave Knits as the Tangled Yoke. I’m using some Brown Sheep worsted in colorway Prairie Fire. It’s a really pretty deep red and this yarn is a rather good value. Compared to Tangled, this project almost flies off the freaking needles! I am torn by this design though. The stockinette of the skirt curls something fierce. 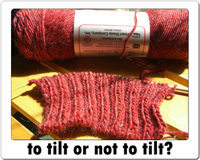 I’ve perused Ravelry to glean some knowledge from folks who are ahead of me on this one. I’ve found that many find the sleeves to be tight and the stockinette skirt of the sweater needs to be blocked like heck and darnation. Some are also finding the collar fussy and I’ve seen some modified to be open like a lapel type collar. Cute variation. One knitter made a hem to combat the hated curl of stockinette and I’m drawn to this idea. I may hem or knit 4 or so rows of 2×2 rib at the end (you knit the skirt top down). I’m fully prepared to rip the whole shebang out in the end though. If it’s going to be a pain, it’s going down buddy. Tough love.